Banten design and manufacture marine antennas for military, leisure vessels and GMDSS requirements. Get TV on your boat, receive crisp clear am\/fm radio, or ensure reliable communications with marine vhf antennas and aerials. VHF Radio antennas come in a variety of models for high performance and low profile requirement. Wifi and WiFi LAN also available. ANT VHF 2.40MT 6DB 5.0MT RG58 Features: • Spark DB\/12\/C. 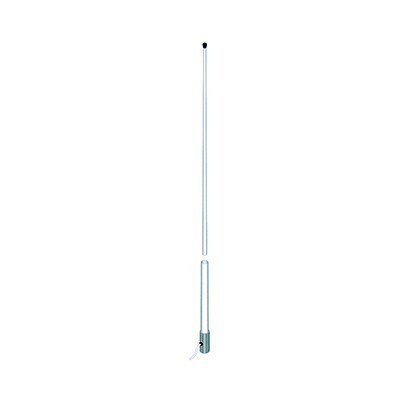 • Vhf antenna with brilliant finish, Nylon ferrule. • Frequency: 156 -162 Mhz. • S.W.R: 1,30. • Gain: 6 dbi. • Impedance: 50 Ohm. • Max Imput: 25 W. • DC Closed: Yes. • Length: 2,50 mt (8 ft). • Weight: 600 gr (14 oz). • Termination:5,0 mt( 16 ft) RG58 C\/U. • Base fitting: 1\"-1 4 female nylon ferrule.